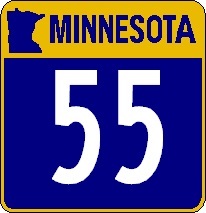 Minnesota State Route 55 is an east-west highway in Central Minnesota. It runs from the Minnesota/North Dakota State Line, at the Boise de Souix River Crossing, near Campbell Township, to U.S. Rt. 61, at Hastings. Info on MN St Rt 55 is broken down by county below.